I'm going to be unplugged for the next little while. I take these times of quiet. You bless my heart. Sometimes I have found it to be necessary. I plan to be unplugged in every area of this online world. Lord-willing, I will catch up with y'all in a few weeks. Until then, I'd like to leave you with some Scripture. How wonderful it is to soak our hearts and minds in truth. It is absolutely the only way forward. The best way to live. May the Lord be your portion day after day. He is faithful. This stuff is a little dangerous. bowl in less than 30 minutes. Scary, right? Oh well. Throw caution to the wind. Exercise tomorrow. My sister shared this recipe with me. I tweaked it just a little. Whisk together all the ingredients in a bowl until dissolved. 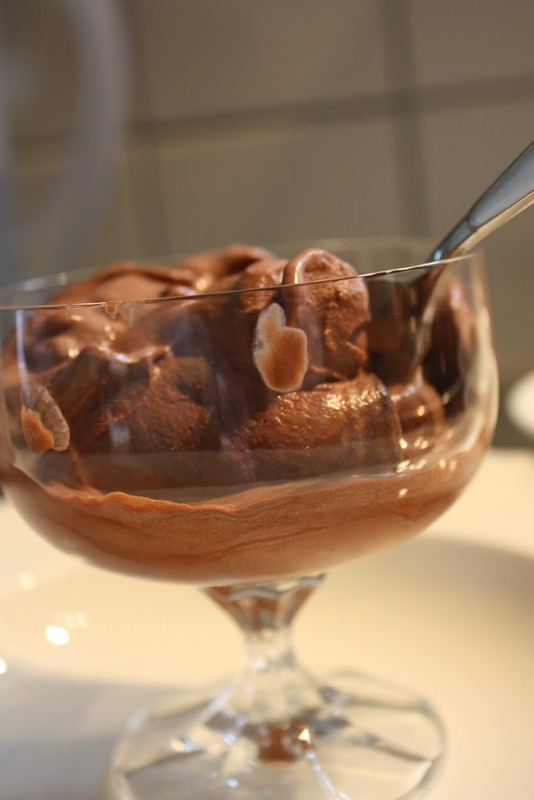 Churn in your ice cream maker for approximately 20 minutes. Serve immediately to four or five very happy people. We often go and tend to Austin's grave. 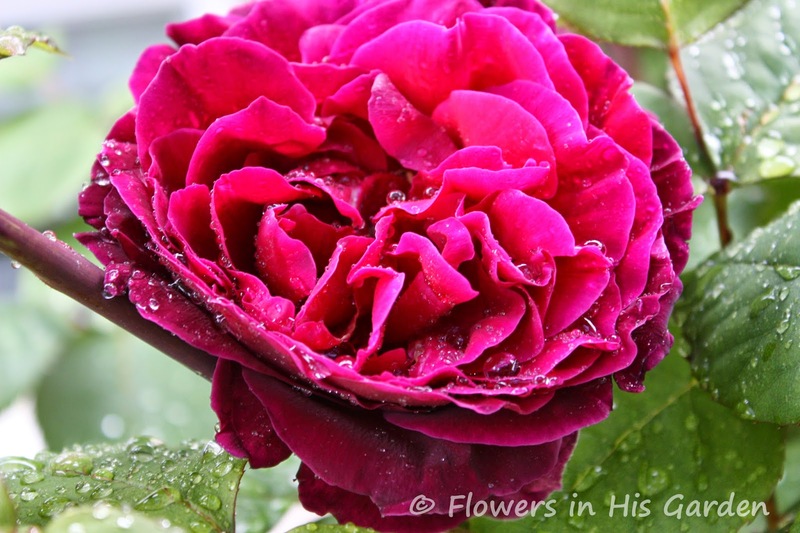 We water the flowers and clean off his stone marker. by God's beautiful creation. We are thankful. A few weeks ago, I was at Austin's grave alone. I had made a detour on my bike, and stopped by for a few minutes. A lady walked past me with her dog and we exchanged a few words. Her husband was buried not far from our son. She is eighty. gentleman grooming some graves a little way off. When I was leaving, I acknowledged his work. He engaged me because I had engaged him. He is ninety. His wife has been gone six years. His hobby is tending her grave and those around it. We exchanged stories and quickly began talking about eternal things. His face lit up when he realised I was a Christian. We made a connection. He wanted to see Austin's grave. Then, he weed whacked it for me. He said he would add our son's plot to his roster. He's been back since. that are anything but *chance*? Furthest thing from the truth. intersects with another's. Sometimes only once. We are keenly aware that our Lord orchestrates every meeting. He so gently leads us along. He is with us each step of the way. May we be found following Him wherever He leads. Until He calls us Home. I've served these up for brunch. Yessirree...I have! They do not qualify as *healthy*. But, dear me...are they ever good! I'll bet you'll love them as much as we do. You won't regret it if you bake up a batch. Promise. 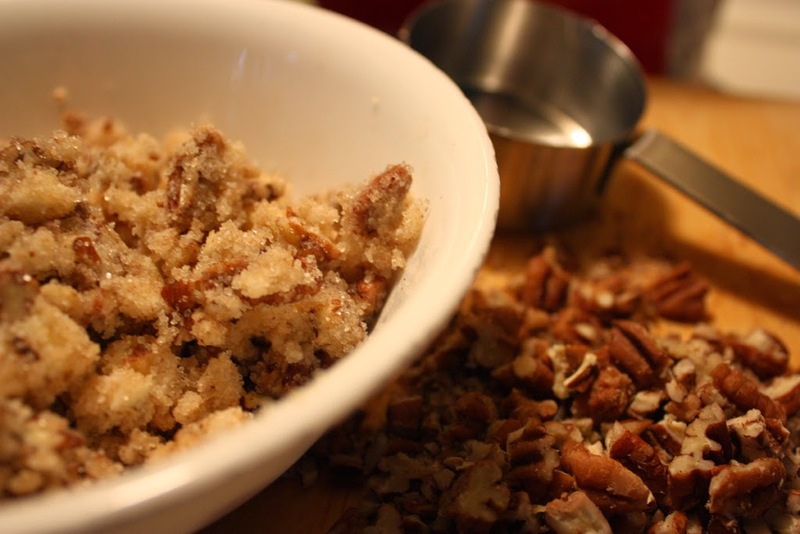 Measure first three ingredients into large bowl and mix together with a whisk. In another bowl, beat the egg and whisk into it the sour cream, melted butter and vanilla. Add the sour cream mixture to the flour mixture and stir by hand until just moistened. 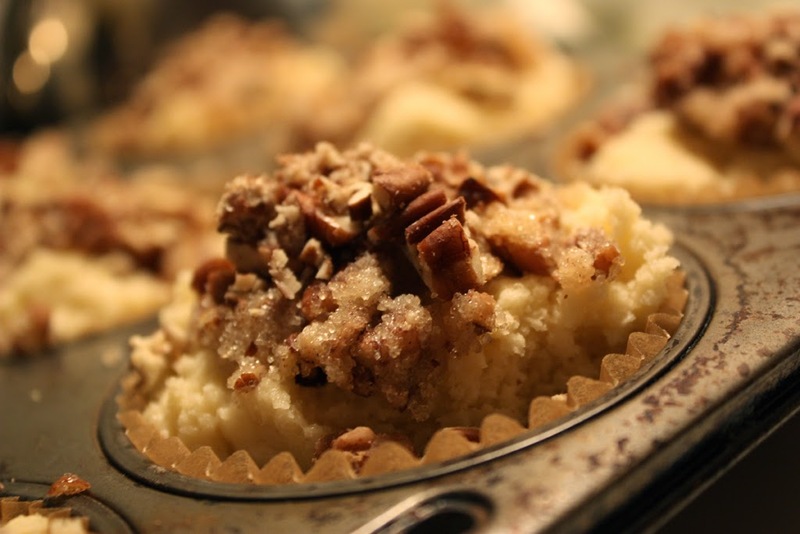 Fill twelve parchment (or paper) lined muffin cups with batter. a medium bowl. Cut the butter into these two ingredients. onto each of the muffins prior to baking. Press down a little. 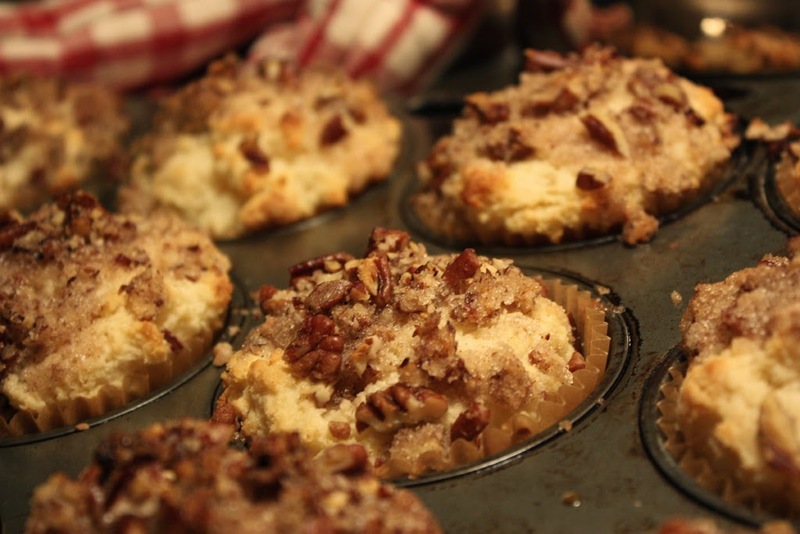 Divide the topping evenly between the twelve muffins and bake. Bake at 400 degrees F for approximately 18 to 20 minutes. 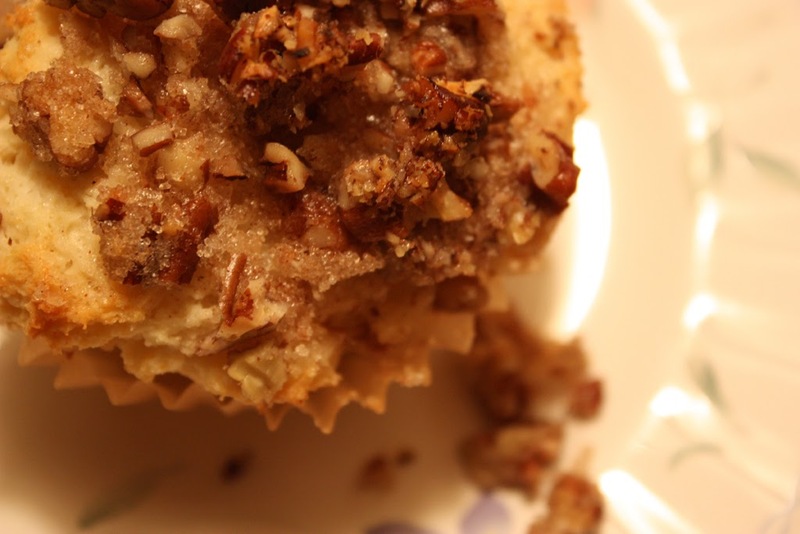 Done when a toothpick inserted into the centre of a muffin comes out clean. Remove to a wire rack to cool. Don't cool too much ~ these are best when warm. It's a good idea to have a few loved ones nearby to share with. into a hat, and Emma pulled one out. 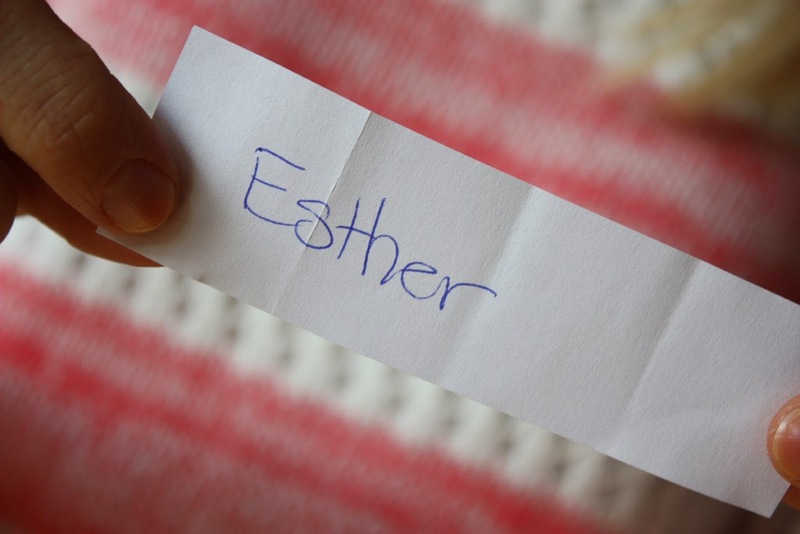 Sixteen Months ~ A Giveaway! Very often, we mark the ages of our babies in months. I remember answering inquiries into the ages of ours in that way. And, now...I mark the home-going of our Austin in months. I cannot bring myself to think of it in those terms. marks another mile-stone for us and for our son. We are closer to eternity. He is already in it. Some days, we feel numb with all that has happened. Other days, we are washed over with great sorrow. But, we continually redirect our gaze on those eternal things. It's the only way to continue to live. on the subject of Heaven since our Austin was called Home. There are so many accounts of people who have supposedly visited Heaven. what they saw and what they did while they were there. But, were they really there? Not much in these accounts rings true with the Scriptures. All we need to know is revealed to us within its pages. Some information on Heaven is withheld. And, rightly so. Much of it is too wonderful to put into words. reveal what he had been shown. 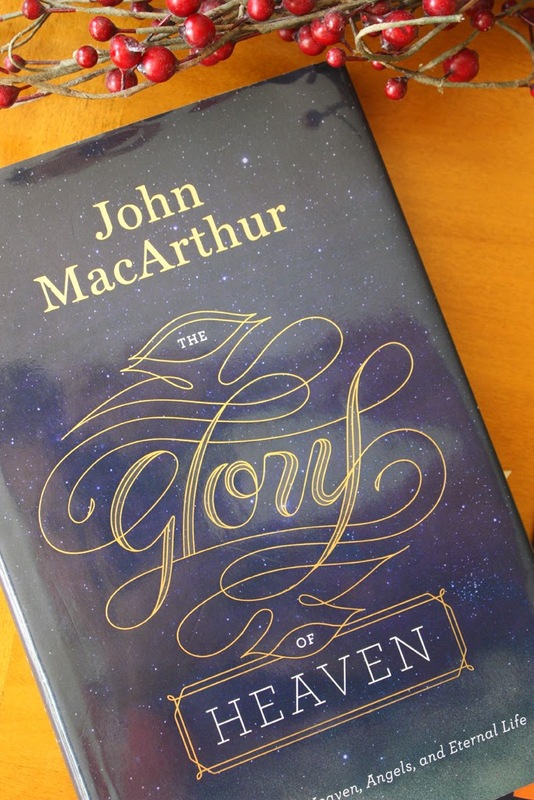 One book that has encouraged our hearts is "The Glory of Heaven" by John MacArthur. and teaches from that reference point. It is refreshing and reaffirming. 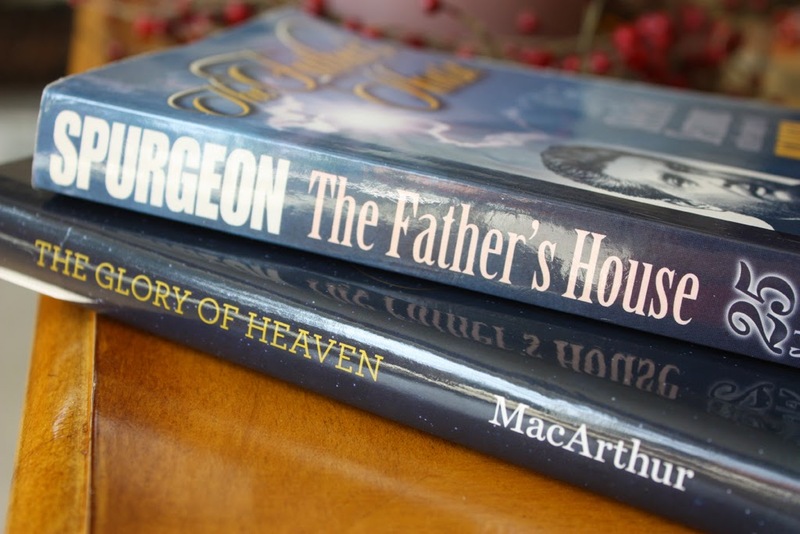 He refutes many of the errors that are swirling around on the subject of Heaven. He brings the reader back to the bedrock ~ The Word of God. The Bible is the ultimate authority on all these things. Would you like your own copy of this book? No matter what stage of life you are in, I am sure you will be blessed. There is never a bad time to fill our minds and hearts with truth. It's always a good and wise thing to do. One copy have been set aside for one of you. 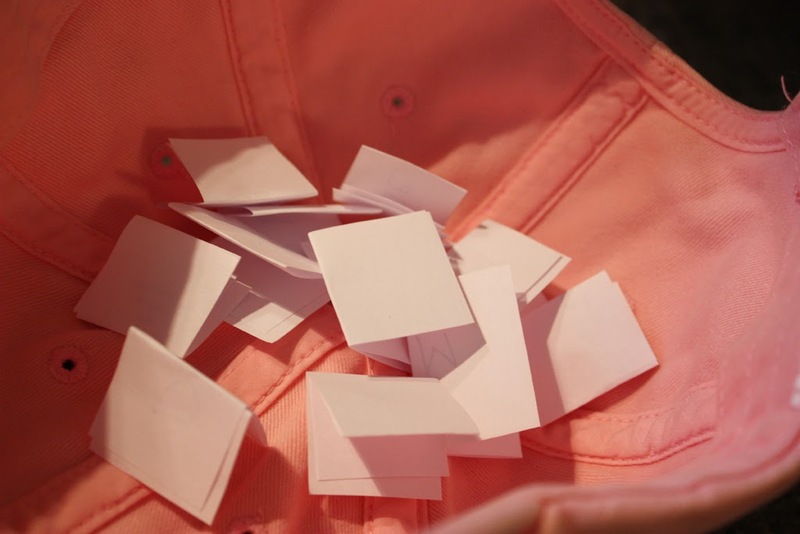 All you have to do to be entered into the draw is to leave a comment. on Monday, October 6th at Noon, Pacific Standard Time.